Well-drafted outdoor lighting ordinances provide plenty of lighting for the safe enjoyment of the outdoor night environment, while conserving energy and mitigating unsafe glare, light trespass, and light pollution that steals the night sky from all of us. While most outdoor lighting ordinances “grandfather-in” existing light fixtures, they also most importantly establish guidelines for the quality and quantity of light emission from new light fixture installations. The better lighting ordinances also include “sunset” clauses for some of the most obnoxious light fixtures: the unshielded dusk-to-dawn security lights and flood lights. 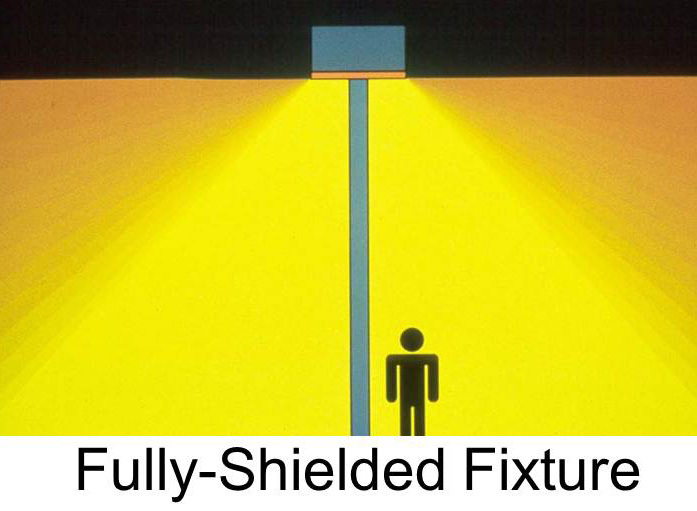 The most important concept for good quality outdoor lighting is to use “fully-shielded” fixtures that direct the light down where it is needed. The city of Asheville is located in Buncombe County, North Carolina, and both the City and County have very well-drafted outdoor lighting ordinances – two of the best in the state. In Buncombe County four incorporated towns/cities have outdoor lighting ordinances: Asheville, Woodfin, Weaverville and Black Mountain (a complete copy of each town’s ordinance is linked below). If you live in one of these incorporated areas, then the town’s ordinance has jurisdiction rather than Buncombe County’s ordinance. Buncombe County’s lighting standards (adopted in January 2012) can be found in Sec. 78-668 of the Buncombe County Code of Ordinances. City of Asheville: On December 11, 2012 the City of Asheville amended and improved its outdoor lighting ordinance. Find it in Part II, Chapter 7, Article XI, Section 7-11-10 of the City’s Code of Ordinances. Town of Black Mountain: Black Mountain implemented its outdoor lighting ordinance in 2004. Find it in Chapter 20, Article VII of the town’s Code of Ordinances; it is located on page 83 of the above file link. Town of Weaverville: Weaverville implemented an outdoor lighting ordinance in 2007. Find it in Chapter 36 (Zoning), Article I, Section 36-26, of the town’s Code of Ordinances. Town of Woodfin: Woodfin implemented an outdoor lighting ordinance in October 2009. Find it in Chapter 152 of the town’s Code of Ordinances. Duke Energy (DE) – has its fingerprints all over 2 of these 5 ordinances (Black Mountain and Weaverville). DE engages with communities that want outdoor lighting ordinances. They steer the process, and set these ordinances up in a way that minimizes or completely omits restrictions on street lights, the obnoxious dusk-to-dawn security lights, flood lights, parking lot lights, and on most of their other outdoor lighting products (all of which DE sells, leases, maintains and installs). 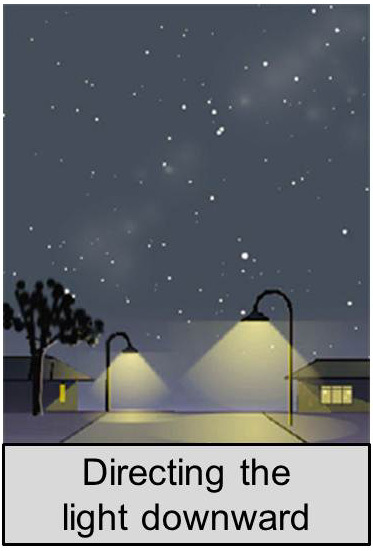 In other words, DE does not restrict the products they market – the very ones that create the most light pollution! Instead they set up rather token outdoor lighting ordinances. Weaverville and Black Mountain are good examples of token DE lighting ordinances; and they lack any real effective lighting restrictions. DE also works to exempt certain downtown and historic areas completely from the lighting ordinances. This explains the glaring “light bombs” in downtown Asheville and in Biltmore Village. Those lights are called “historical”! The excessive, unshielded luminosity of these fixtures is about as far from the historical gas and candle lamps as one can get! Of course, these “historical” fixtures also add immensely to our carbon footprint. Having DE help write a community’s outdoor lighting ordinance is like asking the fox to write a protection plan for the hen house!
" Learn to reverence night and to put away the vulgar fear of it; for, with the banishment of night from the experience of man, there vanishes as well a religious emotion, a poetic mood, which gives depth to the adventure of humanity." " An unpolluted night sky that allows the enjoyment and contemplation of the firmament should be considered an inalienable right of humankind equivalent to all other environmental, social, and cultural rights. "